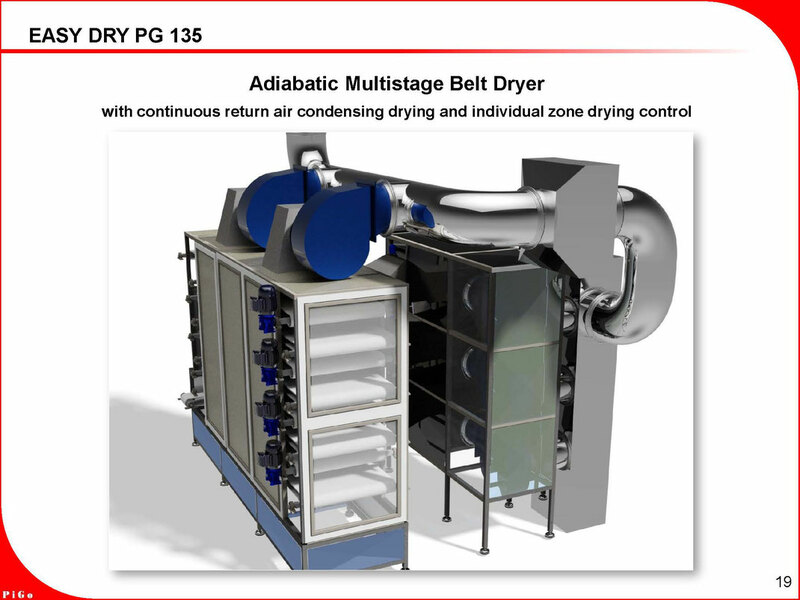 ADIABATIC MULTISTAGE BELT DRYER EASY Dry PG 135 is giving to the user possibility to dry product at very low temperatures, with up to 2-3 times shorter drying time, preserving by this product color and quality. Choice of drying temperature is up to user. Complete machinery is realized in stainless steel and materials ideal and approved for use in food industry. Product is conveyed through drying process by belt conveyor(s). There is possibility to use both stainless steel wire mesh belt, as well as modular plastic belt realized in plastic material supporting up to 190C temperature. Through the drying process, product is transfered between the belts (from the upper belt to the bellow belt), providing continuous turning of the product and, by this, more uniform drying. Process is conducted by PLC, if desired continuously by recirculated air, with possibility od air refreshment by ambiental air. 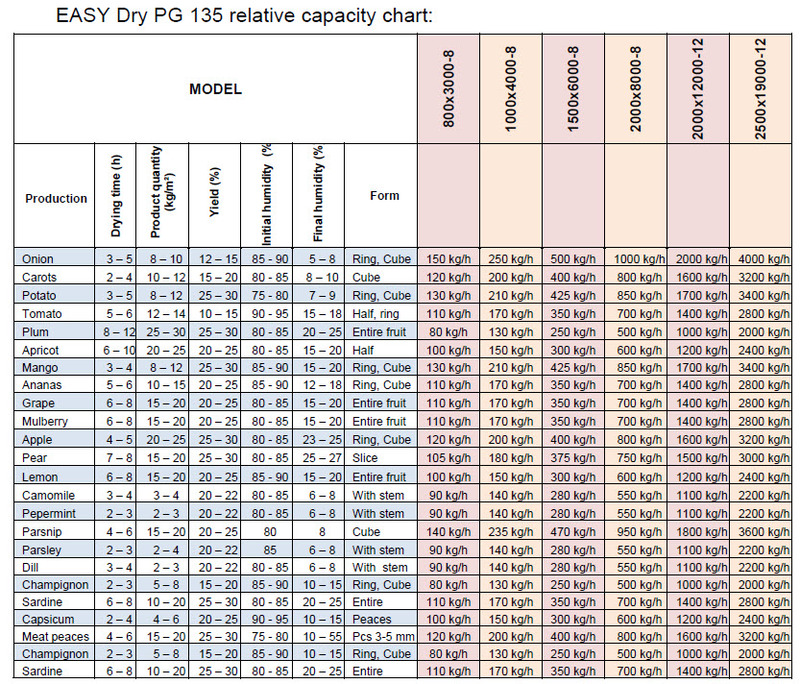 The most efficient products drying,and the best drying effect is obtained using continuously dried air (up to only few percentages of the humidity in the air). 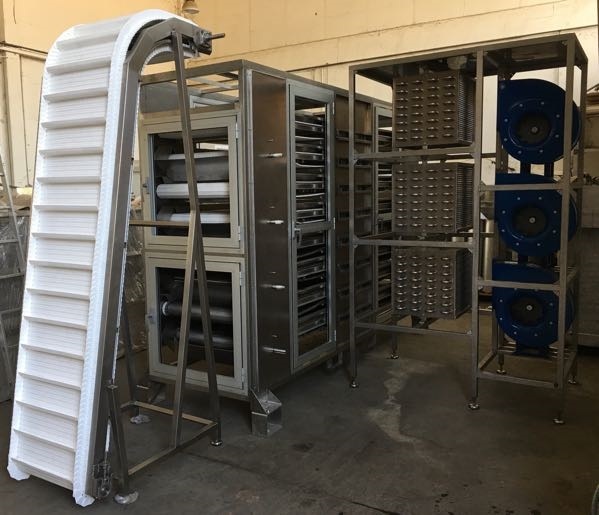 Since drying efficiency of the air is dropping down drastically when air is coming to saturation of 50 -60 % od humidity, it is necessary to provide efficient air drying, in order to shorten drying time and provide products drying on lower temperatures. Efficient air drying is provided by condenser unit (working on 5-7C temperature), installed on the returned air flow. This condensing unit is providing possibility for continous work with only recirculated air, what is very particulary important if you are dring the product which is very easily prone to oxidation. Of course, if desired, there is always possibility of introducing fresh air, through opposite flaps - fresh air inlets. After passing air drying section, "dewatered" air is again heated u to required temperature by passing through heat exchanger. As previously mentioned, cooling unit condenser can be used practically as main heating source. 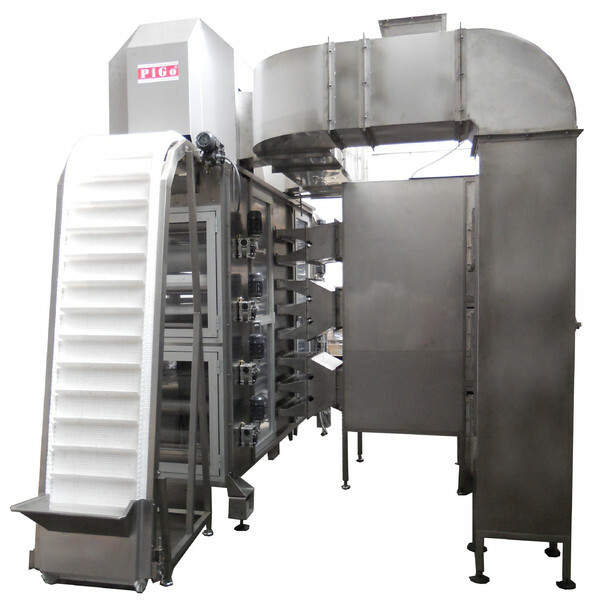 Number of heat ezchanger determinates the number of of drying zones, since in each zone is possible to control and set up different temperature, according to product characteristics and requirements ("multi stage drying"). Each section is also equipped with air filtering groups. Hot air is blown through the product by powerful fans, in predetermined multiple points, providing corresponding and uniform air flow and uniform drying. Indirect heating is carried out by using hot water, steam, thermal oil or waste heat from an existing plant. If complete condensing and cooling system is supplied by PIGO, it is possible to use heat produced by cooling unit condenser for heating dried air, and drasticaly (up to 80 %) reduced quantity of steam (or other heating source). Extraction of dried product is executed by one transfersal belt. 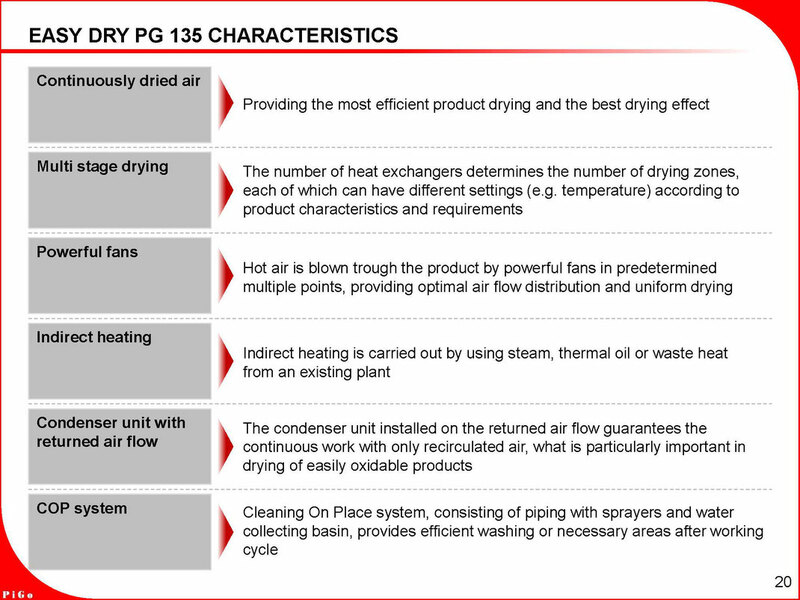 EASY Dry PG 135 is equipped with partial COP (cleaning on place system), consisting of piping with sprayers, and water collecting basen, providing efficient washing or necessary areas after working cycle.